The rapid implementation of new molecular methods in support of precision medicine has been both exciting and challenging to pathology. Next-generation sequencing is coming to maturity as a clinical procedure, with concomitant development of guidelines for assay validation and performance, quality standards, and proficiency programs. Evolving issues include the type, target, and timing of genomic analysis of tumors and regulatory and reimbursement issues. Additionally, educational needs for pathology trainees, practicing pathologists, and clinical colleagues should be addressed. The cancer genome atlas. Available at cancergenome.nih.gov. Kamel-Reid S, Zhang T, Persons DL, et al. (Molecular Oncology Resource Committee of the College of American Pathologists). Validation of KRAS testing for anti-EGFR therapeutic decisions for patients with metastatic colorectal carcinoma. Arch Pathol Lab Med. 2012;136:26–32. https://doi.org/10.5858/arpa.2011-0220-OA. http://www.ncbi.nlm.nih.gov/pubmed/22208484. Allegra CJ, Rumble RB, Hamilton SR, Roach N, Hantel A, Schilsky RL. Extended RAS gene mutation testing in metastatic colorectal carcinoma to predict response to anti–epidermal growth factor receptor monoclonal antibody therapy: ASCO provisional clinical opinion update 2015. J Oncol Pract. 2015; https://doi.org/10.1200/JCO.2015.63.9674. NCCN clinical practice guidelines in oncology: non-small cell lung cancer v. 3.2017. www.nccn.org. Training residents in genomics. 2012. www.pathologylearning.org/trig/resources. Deans Z, Watson CM, Charlton R, et al. Practice guidelines for targeted next generation sequencing analysis and interpretation. 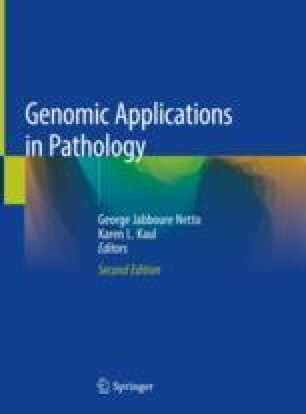 http://www.acgs.uk.com/media/983872/bpg_for_targeted_next_generation_sequencing_-_approved_dec_2015.pdf. Perkel JM, Fung PA. Next-gen sequencing 2016 update, www.biocompare.com.